MANILA, Philippines – The Professional Regulation Commission (PRC) is expected to release result of April 2019 Registered Electrical Engineer (REE) and Registered Master Electricians (RME) board exam on Wednesday-Thursday, April 24-25 or in 3-4 working days after the exam. PRC adminitered the EE board exam in various testing centers nationwide: Manila, Baguio, Cagayan de Oro, Cebu, Davao, Iloilo, Legaspi, Lucena and Tacloban on April 15 and 16 (REE) and April 17 (RME). In the April 2018 EE board exams, Kevin Restubog Relleve of University of the Philippines (UP) - Los Banos aced the REE with 92.75%. Meanwhile, Jayson Butad Bonajos of Bohol Island State University (BISU) - Tagbilaran topped the RME with 93.00%. In the April 2017 exams, Kent Meyler Malones Samaranos of Mindanao State University (MSU) - General Santos City got the highest place for REE with 90.90%. Cedie Orain Pamplona of Bicol University (BU) - Legazpi led RME passers with 94.00%. Strong earthquake on April 22 may cause delay on the release of results due to early dismissal of work as employees need to evacuate the building for safety purposes. MANILA, Philippines – The Professional Regulation Commission (PRC) and the Board of Electrical Engineering (EE) released results of April 2019 Registered Electrical Engineer (REE) and Registered Master Electricians (RME) board exam on Wednesday, April 24, 2019 or in three (3) working days after the exam.. The complete list of passers, topnotchers (top 10), top performing schools and performance of schools are available here as announced online. PRC conducted the licensure exam in the cities of Manila, Baguio, Cagayan de Oro, Cebu, Davao, Iloilo, Legaspi, Lucena and Tacloban on April 15 and 16 (REE) and April 17 (RME). The Board of Electrical Engineering is composed of Engr. Francis V. Mapile, Chairman and Engr. Jaime V. Mendoza, Member. The REE board exam covered the following subjects: mathematics, engineering sciences and allied subjects (April 15) and electrical engineering professional subjects (April 16). For RME exams, it covered technical subjects ( i.e. basic electricity, test equipment and electrical measurements) and Philippine Electrical Code (April 17). According to PRC Resolution No. 1127, the target release of Electrical Engineer board exam results is on Wednesday, April 24 or in three (3) working days after the series of exams. However, results may be released ahead of the target or in later date. We advise takers to monitor announcement of results starting Tuesday. In the April 2018 electrical engineering board exam, results were announced in three (3) working days. A total of 1,315 out of 2,523 Registered Electrical Engineers and 1,831 out of 3,656 Registered Master Electricians successfully passed the tests. In the April 2017 exams, results were also released in 3 working days. PRC named 994 out of 2,213 who passed REE and 1,817 out of 3,130 who hurdled the RME. MANILA, Philippines — The Professional Regulation Commission (PRC) and the Board for Professional Teachers (BPT) released results of March 2019 LET or teachers board exam expected anytime between May 13 and 31 or in 32-46 working days after the exam. The complete list of passers, top 10 (topnotchers), top performing schools and performance of schools are available on this page as announced online. PRC administered the first LET board exam this year on Sunday, March 24, 2019 in at least 20 testing centers nationwide. Testing centers include Bacolod, Baguio, Cagayan De Oro, Catarman, Cebu, Davao, General Santos, Iloilo, Kidapawan, Legazpi, Lucena, Manila, Pagadian, Pampanga, Romblon, Rosales, Occidental Mindoro, Tacloban, Tuguegarao and Zamboanga. Official list of passers will be posted on this site once released (check back for the updates). The schedule for the issuance of Professional Identification Card (ID) and Certificate of Registration for Elementary and Secondary level exams will be posted here once results are out online. The program for March 2019 LET is composed of (2) parts for Elementary — General Education (40%) and Professional Education (60%) — and three (3) parts for Secondary — General Education (20%), Professional Education (40%) and Specialization (40%). The test covered the major areas of General Education (English, Filipino, Mathematics, Science and Social Sciences), Professional Education (teaching profession, social dimensions of education, principles of teaching, education technology, curriculum development, facilitating learning, child and adolescent development, assessment of student learning, developmental reading, field study and practice teaching). The 10 specializations for Secondary Teacher with exam coverage depends on the chosen course: English, Filipino, Biological Sciences, Physical Sciences, Mathematics, Social Studies or Social Sciences, Values Education, MAPEH, Agriculture and Fishery Arts and TLE (Technology and Livelihood Education. According to PRC Resolution No. 1127, which deals with the 'Schedule of Licensure Examinations for Year 2019, the target release date of March 2019 LET board exam results is on Tuesday, May 21 or in 38 working days after the test. The computed total number of workdays excludes 8 Saturdays and Sundays and four (4) holidays namely — The Day of Valor (Tuesday, April 9), Maundy Thursday (April 18), Good Friday (April 19) and Labor Day (Wednesday, May 1). With this, we advise LET takers to monitor release of results starting May 13 (32 working days) to May 31 (46 working days). From time-to-time, PRC Board News will update this page to give the exact release date. In the same period last year, results were out in forty (40) working days. A total of 13,774 elementary teachers out of 58,323 examinees (23.62%) and 22,936 secondary teachers out of 76,673 examinees (29.91%) successfully passed the tests. In the March 2017 LET, results were also released in 40 working days. A total of 5,600 elementary teachers out of 53,915 examinees (10.39%) and 18,482 secondary teachers out of 72,584 examinees (25.46%) passed the exams. 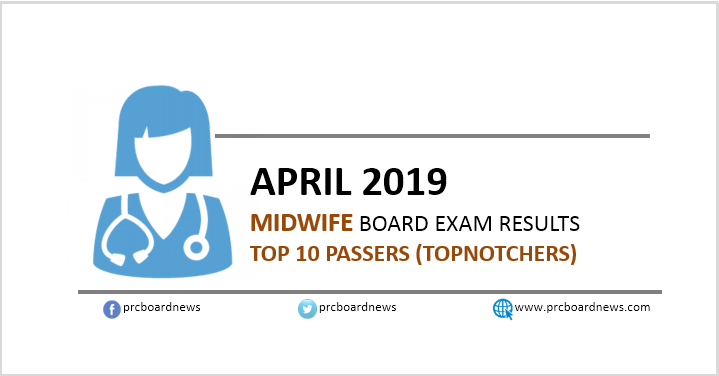 MANILA, Philippines – The Professional Regulation Commission (PRC) and the Board of Midwifery released results of April 2019 Midwife board exam today, April 16, or in three (3) working days after the exam. The official list of passers, top 10 (topnotchers), top performing schools and performance of schools are available on this page as announced online. PRC administered the Midwife licensure exam in the cities of Manila, Baguio, Cagayan de Oro, Cebu, Davao, Iloilo, Legaspi, Pagadian, Tacloban, Tuguegarao and Zamboanga on April 10 and 11. The two-day midwifery board exam covered the following subjects: obstetrics, fundamentals of health care, infant care and feeding, primary health care, professional growth and development. According to PRC Resolution No. 1127, the target release of Midwife board exam results is on Tuesday, April 16 or in three (3) working days after the exam. In the April 2018 examinations, results were released in three (3) working days. PRC named 846 out of 2,145 who successfully hurdled the tests. Dennis Michael Esteban Zequerra of Cotabato Medical Foundation College led the passers with 91.75%. In the April 2017 exams, results were also out in 3 working days. A total of 965 out of 2,194 passed the two-day exams. Kathryn Avery Antonio Aldave from Catanduanes State University (CSU) - Virac aced the board with 91.45%. MANILA, Philippines - The Professional Regulation Commission (PRC) named the topnotchers or top 10 passers in the April 2019 Electronics Technician (ECT) board exam as results are released on Thursday, April 11 or in three (3) working days after the exam. The Board of Electronics Engineering (BEE) administered the licensure exam in the cities of Manila, Baguio, Cagayan De Oro, Cebu, Davao and Legazpi on April 5. Based on PRC Resolution No. 1127, the target release of results for the recent ECT board exam is on Thursday, April 11 or in three (3) working days after the last day of exams. In the April 2018 ECT licensure exams, Mark Jefferson Asuncion Arellano of Cagayan State University - Tuguegarao, Cyrus Peter Miguel Lim of Mapua Institute of Technology-Manila, Dannah Caye Api Palces of Polytechnic University of the Philippines - Maragondon and Fernando Paguio Roman Jr. of MIT-Manila tied on the highest place with identical grade of 89.00%. In the April 2017 board exam, Joseph Alexander Philip Zaldarriaga Lacson of University of Saint La Salle and Joshua Maurice Fabillar Plameras of MIT-Manila topped the board with 92.00%.